April 14, 2019: Landed hard and nose gear collapsed. 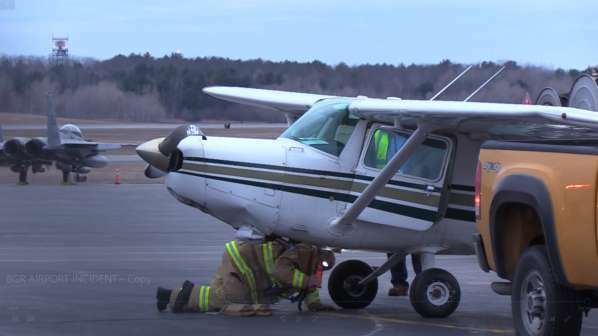 BANGOR, Maine - A plane made a crash landing at Bangor International Airport Sunday evening. The Federal Aviation Administration will be looking into what caused the aircraft to crash. The pilot was taking his private pilot checkride and was demonstrating a short-field landing. During the landing, the wind was gusting, and he decided to go around. During the go-around, the left wing dropped and struck the runway. The designated pilot examiner (DPE) took control of the airplane and completed the go-around. He then returned control of the airplane to the pilot, and the pilot then performed another short-field landing with a full stop. After the full-stop landing, he taxied to the fixed-base operator (FBO) at the airport, and he and the DPE exited the airplane and went into the FBO to complete the paperwork for the check ride. After the DPE had completed the paperwork, the pilot returned to the airplane intending to fly back to his home airport. During his preflight inspection, he noticed that the wing was damaged. Examination of the wing revealed that both wing spars were substantially damaged. The pilot's failure to compensate for the gusting wind conditions during a short-field landing and the designated pilot examiner's delayed remedial action, which resulted in the wing tip contacting the runway during the go-around.